What we learned Week 18 in Math 10 is just reviewing all units that we have been studying for a semester, for the final exam in Math 10. I learned some types of exponents. The steps learning more new information is always interesting, so the first unit of math 10 seemed like the review to me what we learned in grade 9, so, I thought we really began to learn the new information since we learned new types of exponents. I learned about some new types of exponents like fractions and negative numbers, new types of roots (radical signs) like a cube root, and how I can write radicals as a power and a power as a radical. I did not know the existence of cube root before I learnt it. I could learn about units using to measure a height, a length, and a weight. I have not been using only km, m, cm, and mm for a length and only kg and g for a weight. I leant what k, h, da, d, c, and m are with using king henry doesn’t drink chocolate milk, and more measurements like a foot, an inch, a yard, m, g, µ, and n. In Canada and Korea, people do not use an inch, a foot, and a yard, they were kind of strange to me because I have never used and seen it except when I was reading books of some countries in Europe or American. Also, we learned some geometric formula and how we can use them. It is the most interesting unit for me because I was fascinated that we can solve every right triangle with just some of the formula. With this unit, I could make math problems fun and interesting. 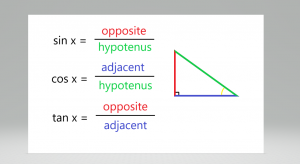 We learnt what and where an opposite, a hypotenuse, and an adjacent, and how I can use them with Sine, Cosine, and Tangent. It was even pretty confusing because it was so easy to misunderstand where the side which we should use is. We learned what domains, range, relations, and functions are. The domain can be used for the input of the independent variable and the range can be used for the output of the dependent variable. Also, each element of the domain in a range and a function is a special type of relation. I even learned more graphs like a function notion. There are a lot of word problem and I am not comfortable in English yet, so in my opinion, it was the most difficult unit to me in math 10. 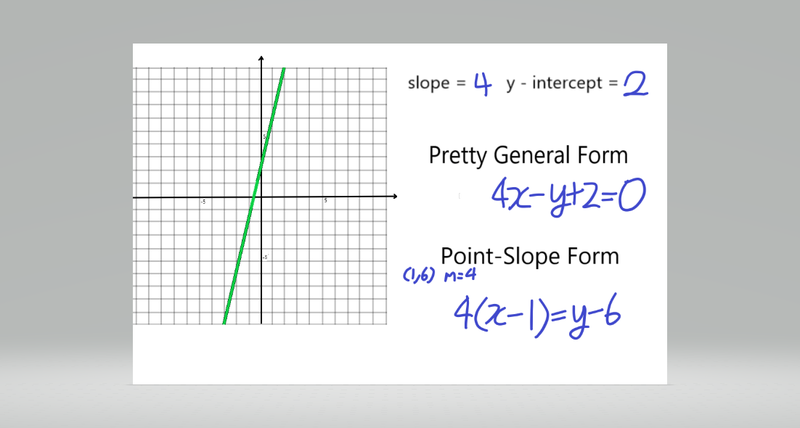 I learned the slope formula (y1 – y2/x1 – x2) and these three different forms y-intercept form, general form, and point-slope form in linear graphs. The information what I learned in this unit was very useful when we should get the answer in the next unit (The systems of equations). It would keep using when precalculus 11, it might be the most important unit in Math 10. It was not one of the most interesting or difficult units in Math 10, but I could make the real interest in math. I had already learned about this unit in Korea where is my home country before I came to Canada, so I thought it would be same. However, I learned a new way to factor and simplify them. In South Korea, people just factored to write every single prime number and got the solution, so it was really unfair to people who were weaker about math than other smart people, and I was not so smarter other guys so my friends and I must be a human calculator for the test. But, I could learn there were infinite ways to get an answer as I learned a square of the factoring polynomials. Some of the new mathematical information was not very much like other units, but the interest in math came to me. So, it was not the most interesting unit, but it was the most valuable unit to me because this unit taught me the interest in math. In my opinion, I could learn a lot of information about math, the way to solve many problems, and an interest in math more in this semester. I must quite struggle with math but I could really enjoy math for this semester, and I hope that the information and interests would not be disappeared until I finish studying math. What we learned in math 10 is how to solve systems of equations. It was pretty interesting to me that we can just get the value of the x and y using two equations. 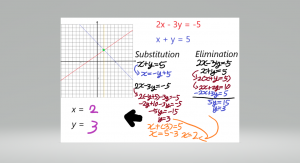 There are two ways to get the solution of a pair of equations, Substitution and Elimination. Substitution is useful when there is a coefficient which value is 1. You can use substitution if you remember how to isolate something on an equation. We should choose the simpler equation (e.g x – 2y = 3) firstly and express one variable in terms of the other. After this step, we need to substitute the expression from the last step into the equation and solve the single variable equation. Lastly, substitute the solution into the equation in the first step to find the value of the other variable. We can solve every single of systems of equations with substitution, but it might be really complicated if there is not a simple equation, so we learned another way, Elimination. I prefer elimination to substitution because I think it is easy for all students in the class unless they do not know how to multiply. Using the method of elimination is very simple. If necessary, multiply each equation by a constant to obtain coefficients for x (or y) that are identical (except perhaps for the sign) and add or subtract the two equations to eliminate one of the variables. After this, solve the resulting equation to determine the value of one of the values. Lastly, substitute the solution the solution into either of the original equations to determine the value of the other variable. We have learned about those ways, However, sometimes, we cannot get a solution of the systems of equations. We must make sure it has zero solution if the slope is same on the equations, and it has infinite solutions if the equations are same. 1. A rectangle is to be drawn with perimeter 64 cm. 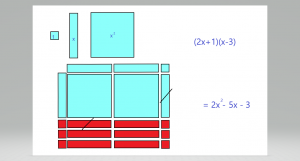 If the length is to be 14 cm more than the width, determine the area of the rectangle. I do not need to multiply any numbers on the equation and just add these two equations. 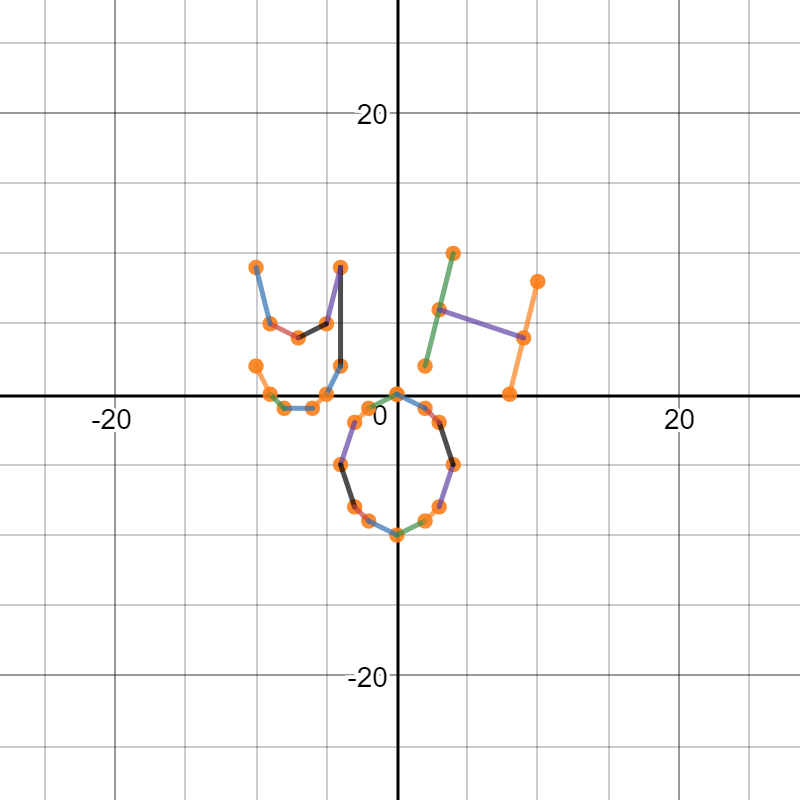 (x + y = 32) + (x – y = 14) => 2x = 46 => x = 23. So, the length is 23 cm, and the width is 9 cm. The system of equations is 2x – 3y = – 5 and x + y = 5. I got the solutions in two different ways. The last step is to substitute 3 on y. x + y = 5 => x + 3 = 5 => x = 5 – 3 => x = 2. 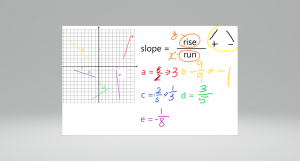 What we learned in week 15 in Math 10 is about a formula to get slopes and kinds of forms. The formula to get the value of a slope is pretty interesting for me. If the coordinates are (x1, y1) and (x2, y2), the formula is y1 – y2 over x1 – x2, so it means, we can the value of slope easily if we know ONLY the two coordinates on the line. A slope is the most important part of these units, and the forms are no exception. 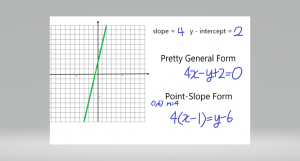 We learned two new forms in this week excepting Slope-Intercept Form which we already know. One of them is Pretty General Form, easily, the numbers must exist on only one side. It must consist of integers, it means there is NO fractions and decimals. Also, it must contain more positive numbers. For example, there is – x + y – 1 = 0, x – y + 1 is better. Another form is Point-Slope Form. The form is used when we know a coordinate and the slope. If we know the coordinate (x1, y2) and the slope is m, the formula of this form is y – y2 = m(x – x1). 1. When the two coordinates of the slope are (3, 7) and (5, – 13), the value of the slope. The formula of a slope is y1 – y2 over x1 – x2. 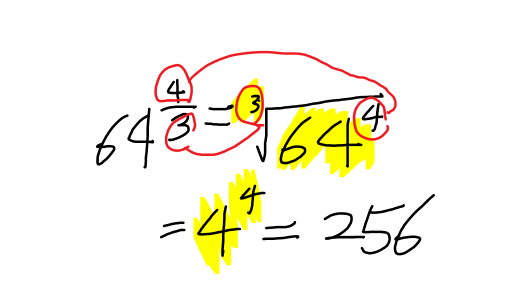 We can substitute the coordinates on the formula, then, it is – 13 – 7 over 5 – 3. – 20 over 2 can be divided by 2, so it is – 10. So, the slope is – 10. The formula of the line is y = 4x + 2, so the formula of Pretty General Form is 4x – y + 2 =0. We know a coordinate (1, 6) and the slope 4. The formula is y – y2 = m(x – x1). 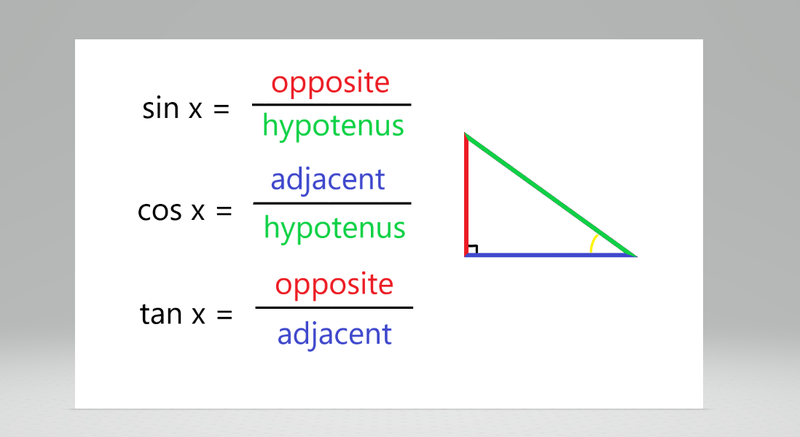 We should substitute the coordinate and slope. So, Point-Slope From is 4(x – 1) = y -6. What I learned week 14 in math 10 is about a slope. The slope of a line segment defines and describes a measure of the steepness of the line segment. The most important part to get a value of the slope is a rise and a run. A rise defines the change in vertical height between the endpoint, and a run is a change in horizontal length between the endpoints. It is difficult to memorize with those meaning because my English skills are weaker, so I decide understanding meanings instead of memorizing. Easily, a rise is a connection with y value and a run is a connection with x value. 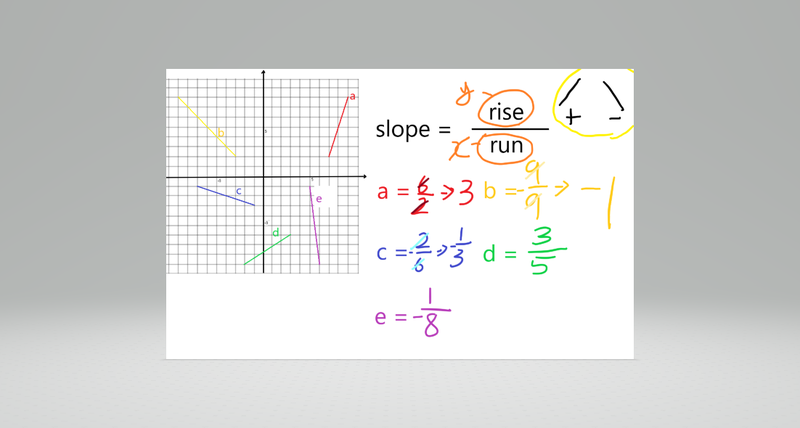 The rise and run are used to make a ratio to get a value of the slope. The ratio is the rise over the run (rise/run). The rise is POSITIVE if we count UP, NEGATIVE if we count DOWN and the run is POSITIVE if we count Right, and NEGATIVE if we count LEFT. a = it counts UP and RIGHT, so its slope is POSITIVE. The rise is 6 and the run is 2, so the fraction is six over two and it can be divided by 2. So, the slope is 3.
b = it counts UP and LEFT, so its slope is NEGATIVE. The rise is – 9 and the run is even 9, so the fraction is nine over nine and it can be divided by 9. So, the slope is – 1.
c = it counts DOWN and RIGHT, so its slope is NEGATIVE. The rise is – 2 and the run is 6, so the fraction is negative two over six and it can be divided 2. So, the slope is – 1/3. d = it counts DOWN and LEFT, so its slope is POSITIVE. The rise is – 3 and the run is – 5, so the fraction is negative three over negative five it can be divided by – 1.
e = it counts DOWN and RIGHT, so its slope is NEGATIVE. The rise is – 1 and the run is 8, so the fraction is one over eight and there is no GCF (Greatest Common Factor) which can divide them. We started to learn Relations and Functions Unit this week. It might be the most difficult unit for me in math 10. I learned about an independent variable and a dependent variable firstly. An independent variable is usually called x, and a dependent variable is usually called y or f(x). A dependent variable is changed by an independent variable in a functional formula. 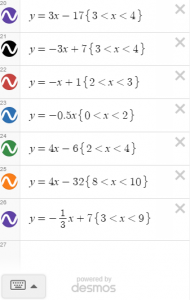 We can get x and y-incepts, a domain, and a range using those variables. When we should get a value of the x-intercept, we must substitute 0 for the y (x-intercept, 0), in contrast, how to get a value of the y-intercept is similarly substitute 0 for the x (0, y-intercept). A domain is the set of all of numbers for the independent variable (input x) in the relation, and a range is almost same as a domain excepting to change the independent variable to the dependent variable (output y). A relation is a comparison between two sets of elements and has connections more than one. 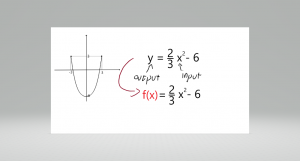 A function is same as f(x) and has only one connection. The cost is a dependent variable, to output, a range, and y. The weight is an independent variable, to input, a domain, and x. It is a function. 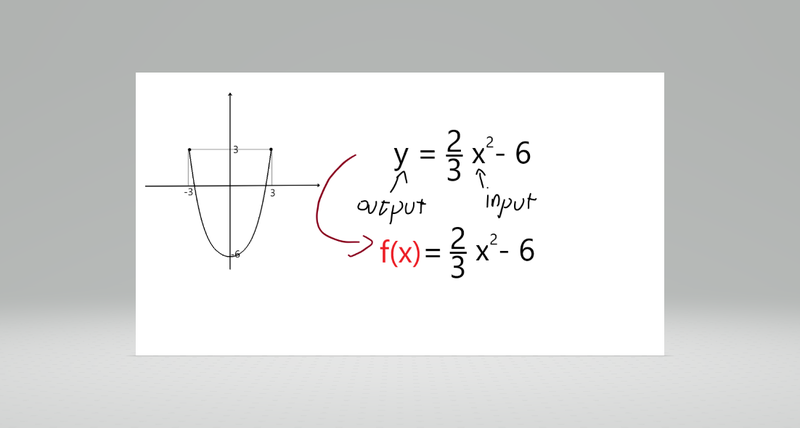 f(x) is same a function, and 2/3 x2 – 6 is a notation. x-intercept is to substitute 0 for y, 0 = 2/3 x2 – 6. So, the x-intercept is equal to 3 and -3.
y-intercept is to substitute 0 for x, y = 2/3 * 02 -6. So, the y-intercept is equal to -6. What we learned Week 11 in Math 10 is to factor when the degree of a polynomial is more than 2. (for examples 4, 6, et cetera.) The bases of factoring polynomials are C, D, P, E, and U. C has used the polynomial which can be divided into common factors. D is differences of squares, it is used when the polynomials are perfect squares. P is to find the pattern of the polynomial. E is used by easy polynomials which can be used the easiest pattern. We can use the bases and solve the polynomials which degree is bigger than 2. We also learned the pattern about a degree. 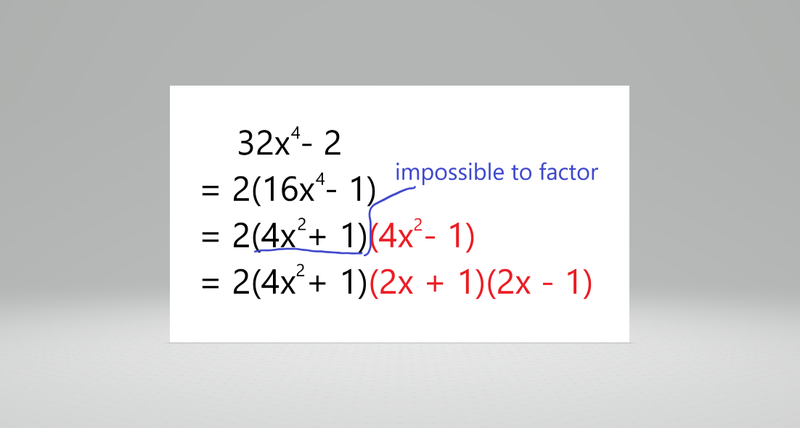 When the degree is bigger than 2, other exponents of x must be half of the degree if there are not any common factors, and it cannot be factored if it is not. For an example, 32x4 – 2 can be divided by 2 (Greatest common factor) and it becomes 2(16x4 – 1). 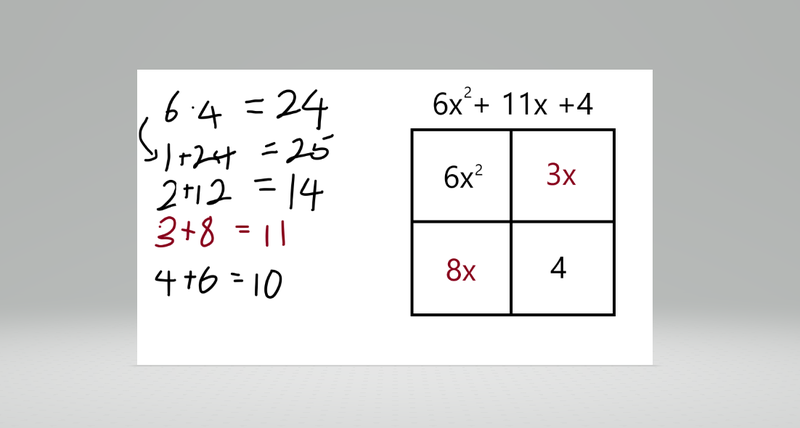 16x4 and -1 are perfect squares, we can use D. 2(16x4 – 1) = 2(42 + 1)(42 – 1). 42 – 1 is even perfect square which can be used D, but 42 + 1 is not because the binomial must have ONE minus sign. 2(42 + 1)(42 – 1) = 2(42 + 1)(2x + 1)(2x – 1). So, the answer is 2(42 + 1)(2x + 1)(2x – 1). What I learned this week in Math 10 is to factor trinomials easily. It seems more difficult, but trinomials that can be factored if we find and use the pattern, it is similar to simplify polynomials. 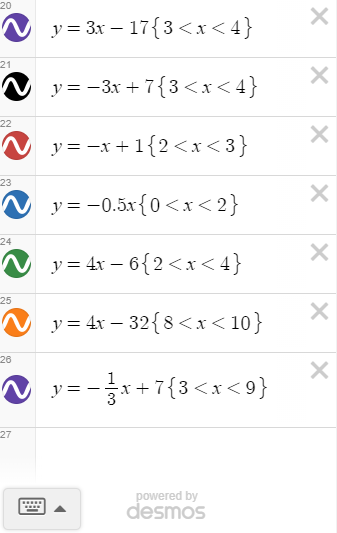 I could find the pattern of factoring other trinomials. It is not different to find and divide trinomials by the greatest common factor (GCF) on trinomials from simplifying polynomials. 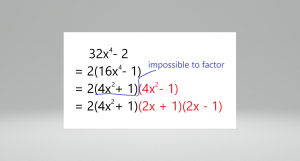 Factoring with Common Factor: find greatest common factor and divide the trinomial by GCF. Factoring the square binomials: the terms in binomials are perfect squares. The most important term in the trinomial in the picture is the first term that is the coefficient of x2 and the term that is just a number. After he coefficient of x2 and the last numbers are multiplied, we can find the factors of the multiplied number. (1, 24), (2, 12), (3, 8), and (4, 6). 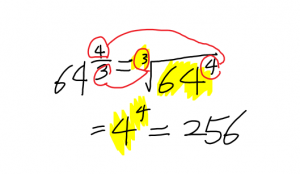 The numbers are added by their pair (1+24 = 25), (2+12 = 14), (3+8 = 11), and (4+6 = 10) and we can find the middle term (the coefficient of x, 11) 3+8 = 11. Factors of 6 are (1, 6) and (2, 3). Factors of 4 are (1, 4) and (2, 2). 1×3 (= 3) + 4×2 (= 8) = 11. We started to learn Polynomial Factoring Unit in this week. When we solve the questions, it takes a lot of time for simplified, so we tried to find the pattern or the method of simplifying polynomials by ourselves. The picture is one of the method to solve binomials easily. x2 is a square, x is a stick, and 1 is a smaller square. 2x and +1 can be each multiplied by x-3. 2x * (x-3) = 2x * x – 2x * 3 = 2x2 – 6x, 1 * (x – 3) = x -3. 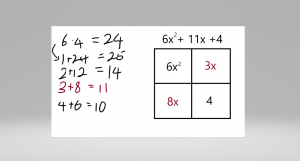 So, 2x2 – 5x – 3. We solve the product of polynomials, I found the pattern how to simplify the polynomials easily. When x is multiplied by x, just multiply the coefficients firstly and multiply x2 too. Just Multiply another number in the polynomial as step 1.